Learn how to make some everyday Italian recipes which can be simple to prepare; especially for people who work or are just busy. For this reason I have chosen to concentrate on cooking a Crock pot Italian recipe. Now I must say I find it hard to link the cooks in Italy to Crock pots or slow cookers. Although I see the much needed usefulness of these cookers, I have never gotten into them. Because most of my life has been spent in a kitchen, I have done all my slow cooking on the stove top. This is how I imagine all the cooks in Italy would do, but I do think a slow cooker would work well for all the sauces like pizza and the puttanesca recipe. The slow cookers and Crock Pot were refined and improved during the 1060’s and 1970’s. They quickly became so popular with the busy cooks in the American homes; not many kitchens were without a Crock Pot. The following years with the growing prosperity and the busy lifestyle of families, the slow cooking process became even more popular. The love of Italy and its delicious well seasoned cuisine makes most cooks want to learn how to make everyday Italian recipes. It is no wonder also requested is a good Crock Pot Italian recipe; especially from Americans. Even though slow cookers have now just become an appliance on the kitchen shelf for many cooks, they still can be very useful. You can learn how to make everyday Italian recipes like the ones I have below in your slow cooker. Hope you enjoy! The Crockpot Italian chicken recipe is among the favorites of everyday Italian recipes. This makes sense being that chicken recipes are the favorite entrée around the world. Chicken can be prepared in many different dishes; the following hot chicken salad recipe is just a sample. Combine chicken, almonds, celery, green pepper, lemon juice, mayonnaise, grated onion, garlic, Italian seasoning and cubed cheese in Crock Pot. Cover and cook on low from 3 to 5 hours; top with crushed potato chips and Parmesan cheese. To serve spoon over bread. This is one of the very good chicken everyday Italian recipes. Cover and cook over low for 3 hours. Combine and beat in small bowl cream cheese and soup until blended; stir in mushrooms. Pour cheese mixture over chicken; cook 1 hour longer or until chicken juices run clear. 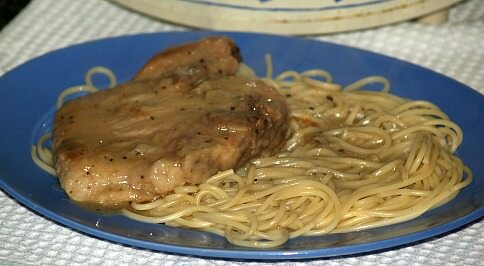 Pork chops make great everyday Italian recipes. Combine flour, dry mustard, Italian seasoning, salt and garlic powder in shallow dish; set aside. Heat oil in a large skillet until hot; dredge pork chops in flour mixture and place in skillet. Brown the pork chops on both side; place chops in slow cooker. Add remaining flour mixture and broth in skillet; stir and cook until smooth. Pour skillet mixture over chops in slow cooker; cook uncovered on high 2 to 2 1/2 hours or until tender. 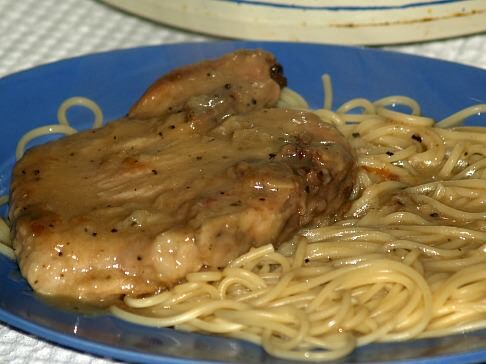 Serve chops and gravy over cooked pasta or mashed potatoes. Put vegetables and meat in Crock Pot. Combine tomato soup, water, mushroom soup and Italian salad dressing mix together. Pour soup mixture over meat and vegetables. Cook for m7 ½ to 8 hours over low; serve over cooked spaghetti or cooked rice.